Joe Chee and Ben Brooks are co-owners of Ukatsu, a Columbia business that is not at all what it seems to be. The dozen large-screen computer stations lining the walls of their business at 1413 Grindstone Plaza Drive give it the appearance of a high-tech video arcade. Their program reaches beyond their southern Columbia location, extending deep into the community. 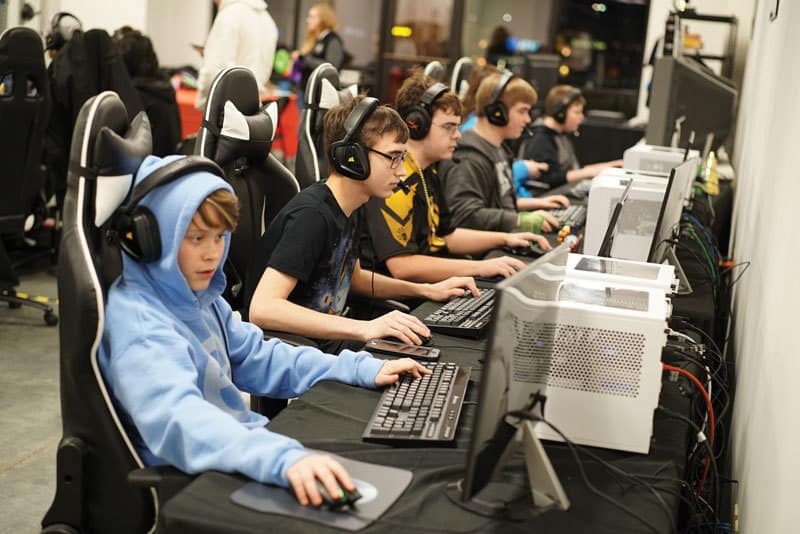 In partnership with the Columbia Public Schools, they have developed a nine-week competitive eSports season that includes travel between schools. Teams of five players compete before parents and classmates on a theater stage. Columbia Public Schools Athletic Director Bruce Whitesides credits them for helping eSports to become part of the district’s sports offering to students. “They’re the experts in management of game tournaments. They’ve had a huge impact on the program,” he says. 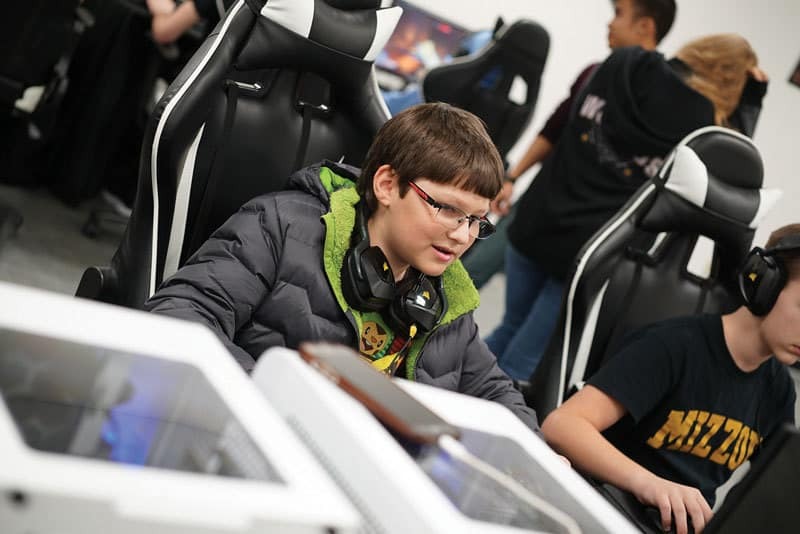 Later this year, Ukatsu will be running a spring break camp, followed by six or seven summer camps, where youths will gain competitive skills in one or more videogames. 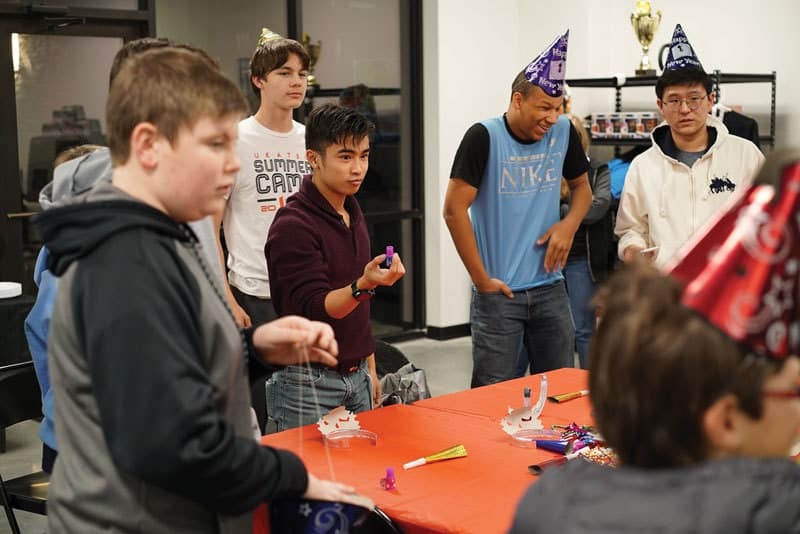 On an ongoing basis, Ukatsu hosts competitions and offers workshops on computer-related topics, such as how to become a Youtuber, how to build a computer or an overview of careers in the videogaming field. Winning may be the gamers’ motivation, but the founders have other, more lasting goals in mind. Physical exercise is integrated into their program along with time for introspection. “We start each day by handing out the kids’ journals. We think it’s important that the kids practice gratitude as well as goal setting and affirmations. A lot of our kids have confidence issues in the real world. We help them learn to focus on what they can do to improve the next day,” Chee says. Older entrepreneurs might consider Brooks and Chee to be youths themselves. Brooks, who ran track in high school and college, still takes a few courses at University of Missouri – Columbia. He is 20 years old. Chee, who has worked as a freelance videographer, is 24. They met a couple years ago when they were counselors at a videogame-themed summer camp that has since quit serving the Columbia area. “We couldn’t bear the thought of the kids not having somewhere to go. So, we created a year-round program, something that could be an ongoing mentorship for all of our families,” Chee says. Despite their young age, both entrepreneurs project a thoughtful confidence and maturity. At work, they wear their black company T-shirt, featuring their corporate logo, a stylized U with eyes that suggest a playful face. Chee explains that the company’s name is a play on a Japanese word, “katsu,” which means “win.” But the word is also a play on another Japanese word, “Yukatsu,” which is a program that encouraged adults to spend more time with their families. “If we could help parents see that gaming can be turned into a meaningful evening activity, we truly do win,” Chee says. Video games have come a long way from the days when Pong or Mario Bros. ruled computer screens. The industry has blossomed into a multi-billion-dollar category, according to Forbes magazine. And it’s not just kids who are fascinated by the games. The average player is 35 years old, and more women are playing each year. Stephens College launched the nation’s first all-female collegiate eSports team last year. To understand what goes on at Ukatsu, a little background into the world of eSports is necessary. While previous generations think of sports in terms of baseball or football, an entirely new way of participating and rooting for teams has developed among younger generations – eSporting events. Teams compete in theater or stadium settings with anywhere from a handful to a stadium-full of fans cheering on their favorite team. An eSports caster voices a running commentary of the action as the game progresses. Ukatsu currently focuses on several popular competitive games – League of Legends and Overwatch. The object of the games is for team members to defeat opponents and advance to new levels in the game. Those benefits are important skills that translate into success in other settings. “The essential elements of a game are that you must set yourself up with a goal; you must know what it takes to accomplish that goal, and you must execute upon that,” Chee says. At Ukatsu, games take place in a social setting, where team members depend on each other and share the camaraderie of competing together. Ukatsu takes what can be an isolating experience for some young people – spending time alone in front of a computer screen – and turns it into a social experience where friendships develop. “I love the community,” Parker Cohen says, a 13-year-old who has been playing videogames since he was six. Before Cohen became a Ukatsu regular, his mother, Aimee, was concerned that videogames might stifle her son’s development. But no more. “We still limit the amount of gaming Parker does, but Ben and Joe have even done workshops on how to stay organized – and coming from Ben, it is so much better than coming from your mom and dad,” she says. Parents frequently start with the perception that videogames can be harmful to their children’s development. But with adult supervision, they can become a positive source of growth. Julie McDermott changed her opinion about videogames after her son, Brady, met Chee and Brooks. “I wish people would understand that videogaming is competitive, just like other sports; the children are learning skills, just like in other sports; and socially it’s huge in building self-esteem. Plus, children are more likely to go on in a career using gaming skills than baseballs skills,” she says. Brady McDermott, now in the 7th grade, finds likeminded people at Ukatsu. “I mainly look forward to finding people I can talk with. I have lots of friends there,” he says. In addition to impacting the Columbia community, the entrepreneurs hope to grow their business and to start Ukatsu centers in other cities. “We’d like to have Ukatsu programs across the nation. We want any kid who wants to learn to do this activity or any parent concerned about videogames to have a place to go,” Brooks says.